Tanya Fields (The BLK ProjeK), Elena Martinez (The Bronx Music Heritage Center) and Wanda Salaman Mothers on the Move) along with other invited South Bronx community leaders will discuss their current programs and neighborhood improvement initiatives. Come and take part in the conversation, learn more, sign up to volunteer and feel free to present your own activism ideas and projects! Residency Unlimited (RU) and Casita Maria Center for Arts and Education is pleased to present Mapping the Memory: conversations and investigations with activists in Hunts Point, South Bronx by artists-in-residence Ana Peñalba and Jorge Rodriguez Mazzini. This collaborative project will be on view at Casita Maria from December 16, 2016 - February 15, 2017 and will include a program that contributes to a building presentation. Mapping the Memory was curated by Newark-based organizer, Rebecca Pauline Jampol. Over the course of a three month RU / Casita Maria Residency, the artists conducted a series of interviews with local South Bronx residents, with a focus on Casita Maria as a binding agent for community. In a neighborhood that has aggressively changed during the organization's 80 years of history, Casita's mission remains true to providing resources, enhancing quality of life for young people and their families, and continues its commitment to strengthen the South Bronx. Interviews conducted are heartfelt testimonies about Casita Maria, as well as honest interpretations of the last century of South Bronx happenings. A combination of post war white flight, real-estate abandonment resulting in socio-economic downfall, transpired defeat in the form of poverty, drug dependency, homelessness, violence, and the devastating slumlord sabotage; “The Bronx is Burning”. Casita Maria was and is viewed as sanctuary and a backbone for cultural protest. Memories of struggle are paired with narratives of strength, family and legacy. “It was always community” says Marta Rivera in an interview conducted by Peñalba. The artists will exhibit a series of investigations based on their findings and relationships made at Casita Maria. 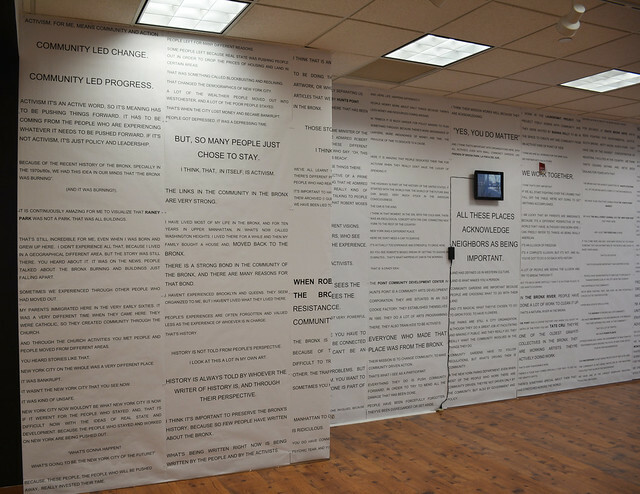 Peñalba will present interviews as installation, developing large text based transcripts that consumes the entirety of the space from floor to ceiling. Text ranges in size to guide the viewer through the space, captivating and educating through first hand accounts and historical nostalgia. Interviewees address a series of South Bronx landmarks throughout their conversations. The transcripts are pleasantly interrupted with strategically placed monitors. Through short environmental videos, Mazzini reveals territory as property and property as ownership, observing the ever-changing landscape of the South Bronx. Together these works will examine agents of change, survival, and notions of home. As a continued way to engage with SB members of action, a mid-project reception will be held that provides a platform for education on present-day initiatives with lively a petchakucha-styled presentation. Ana Peñalba is a designer and information architect born in Madrid, Spain. Her professional trajectory is made of multiple work collaborations in different creative disciplines; combining practice, with teaching, research and self- driven investigations. Since 2012, she has worked as an independent designer investigating the Architectural Systems that conform the collective memory paths that link our daily objects to our cultural codes of spatial inhabitations. Her work combines animations, photography, spatial configurations and drawings. Each of these formats investigates different channels of disassociation between the elements of her study and their established cultural protocols. Peñalba received her Master's Degree in Architecture from the Polytechnic School of Architecture (E.T.S.A.M), Madrid, Spain, 2000-2006; and then a Master of Environment Studies and Bioclimatic Architecture, 2006-2007. She most recently participated in the Spring Session at the AIM Program 2016 at the Bronx Museum for the Arts. Peñalba is currently living and working in New York. Jorge Rodriguez Mazzini is Filmmaker and Cinematographer/DP born and raised in San Juan, Puerto Rico. Mazzini studied cinematography in Buenos Aires, Argentina where he spent eight years filming various short films and collaborating with other filmmakers. Currently he works as a freelance videographer and photographer, in New York City, mostly documenting Tri-state area arts and culture. He has had the opportunity to work in various shorts and feature films both in film and digital formats as a 1st and 2nd AC. He works as an artist assistant/videographer for sculptor David Altmejd and teaches Intro to 16mm filmmaking workshops for the cinema/arts non-profit, MONO NO AWARE. His recent short films, shot mostly on Super 8mm and 16mm film, explore an experimental documentary style. This program is made possible through our partnership with Casita Maria Center for the Arts & Education; with support from the Dedalus Foundation and the National Endowment for the Arts (NEA).